I can’t share enough Gratitude this time of year! Join me for a simple Gratitude project just right for Fall! Get started by printing your favorite fall photos. I popped mine into the new Harvest Moon Mini Canvas Set. Check out more mini canvas sets if you’d like to dress up your photos! I reduced the size to 4 x 4 inches. At that size you can print 4 on a letter size sheet of photo paper. Instagram photos are perfect for this project too, since they are already small and square! 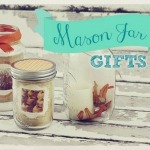 Once you have your photos printed cut out each and slip them into mason jars like the top photo. Now here’s comes the really fun part – adding little gifts of gratitude!! For this mason jar I added 2 packets of Hot Cocoa mix with marshmallows already included. You could add cinnamon sticks or mini chocolate bars too. I traced the wide mouth lid on scrapbook paper and cut out the circle for the mason jar topper. For this mason jar I tucked in a preserved fall leaf and votive size led candle. This makes a really pretty glow on Autumn evenings – even the photo flickers!! Thank you all for visiting with us! I love how easy this project is to personalize or adapt for any season. Wishing everyone HAPPY Project Time!